What made Athertyn and its community the best fit for you both? Chuck: Here’s the big point, Athertyn is not just a new place to live; it’s a change in lifestyle. People might be retired from their work but they’re not retired from living. Leah and I travel a lot, visit museums, go out to dinner and volunteer, like at the Simeone Automotive Museum. The Clubhouse is a center of activity at Athertyn, from the fitness center to the pool. The residents started a book club and a dinner club with international and regional-themed menus that meet every other month. All residents are invited to participate; the choice is theirs. Leah: There is a lot of diversity in our community with people of different ages, backgrounds, careers, and interests. We aren’t all the same and I find that very appealing because it makes great conversation. Chuck: Someone remarked the other day, ‘This is such a wonderful place to live. I feel as though we’re not just friends; we’re family.’ It’s very true. Our residents’ grandchildren play together when visiting. In fact, our five granddaughters love coming over and going to the clubhouse, swimming in the pool with the other kids. Describe the home experience for people thinking of right-sizing. Chuck: It’s amazing how you can have the same model as someone else, yet each condo looks so different inside. Every home has an individual style, whether it’s contemporary, country French, or whatever reflects the owner’s taste. 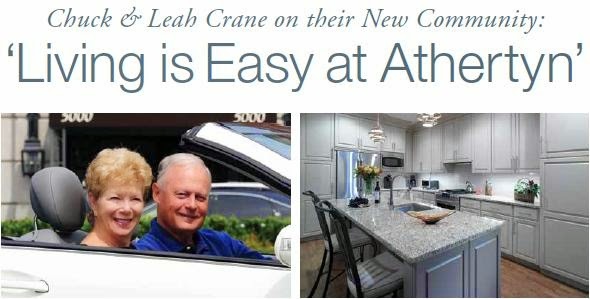 Leah: Athertyn’s steel and concrete construction is amazing — we never hear our neighbors. The doors are solid wood. The ceilings are nine feet high. The woodwork is just beautiful. And you can customize each room. A lot of people here still work, so they design a lovely home office. Chuck: Remember to move while you can, not because you have to. Leah and I wanted a place that was new construction with single-floor living and manageable, where a lot of the work is taken care of for you. And because our space is smaller, our energy, insurance and home cleaning bills went down. Tell us more about how easy it is to come and go here. Chuck: Leah and I have traveled a lot over the years. We’ve been to Europe many times and all over the States. My work allowed us to take our children on nice trips, too. My next goal is to rent an apartment in Paris for a month and just take day trips from there. The nice thing is you can do that with a home at Athertyn and not worry about anything. You essentially lock your door and leave. When you return, everything will be as you left it.